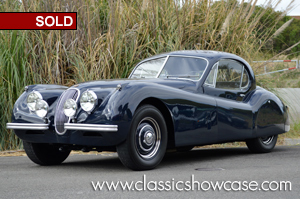 (SOLD) This magnificently styled 1952 Jaguar XK-120 has lines and beauty way ahead of its time, begging to be driven and enjoyed. The Coupé is a matching-numbers car, elegantly presented in an exquisite color combination of Jaguar Dark Blue over a Grey leather interior. Benefiting from a comprehensive restoration by Jaguar professionals, the Coupé was fully disassembled and documented; then it’s motor, transmission, mechanical components and systems were fully restored, then completed with a high-quality finish repaint to Jaguar Dark Blue, the results of which are nothing short of spectacular. Dispatched from Coventry on November 14, 1952, this beautiful import-model Fixed Head Coupé was transported to the famed distributor/dealer Charles Hornburg, who sold the car to Mr. A. K. Harris; Mr. Garland Gray of Waverly, Virginia, then purchased the car in Arizona, and owned the Coupé for 14 years until purchased by it's recent owner. In recent years, master technicians at Classic Showcase performed documented service and detail work, along with numerous mechanical improvements which included: an improved front disc brake conversion, a new master cylinder, aluminum radiator, electronic ignition, converted positive ground 12-volt battery, and a Davis-Craig in line water booster pump. The 120’s undercarriage and engine bay are tidy and well detailed overall; a beautiful, wood-trimmed interior, full instrumentation, rear wing spats and Lucas driving lamps complement the XK-120’s unique styling, further capturing the essence of classic British motoring. Consistently garaged and well cared for, the Coupé has been driven sparingly and judiciously in good weather since it's restoration, and has been crowned a winner at several Jaguar and British Classic Car themed events. 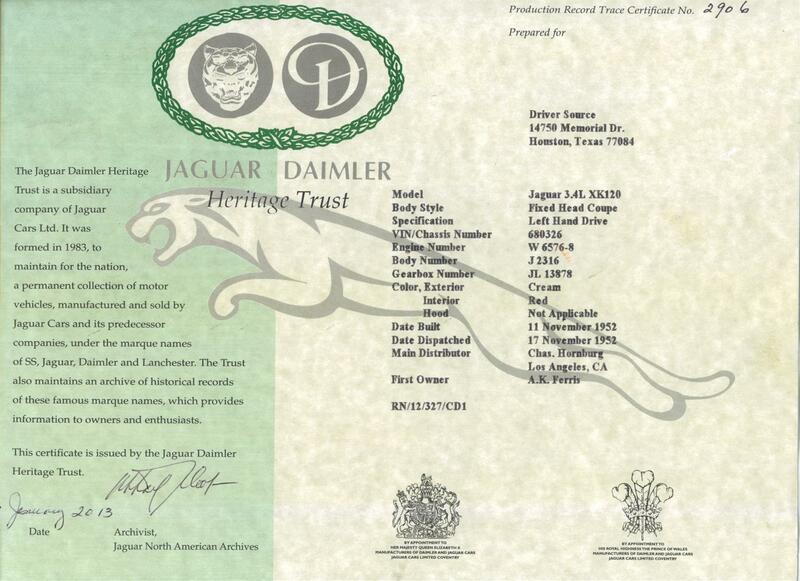 More recently, the car has received a complete freshening up and servicing by Jaguar professionals at Classic Showcase, which included adding new fluids and filters throughout, as well as having the cabin reupholstered in the correct leather and materials. This XK-120 Fixed Head Coupé is just as elegant as it is sporty, and will make its next owner eligible for competition in Concours or vintage events. Don’t miss this opportunity to experience one of Jaguar’s most iconic vehicle designs ever produced. The XK120 was originally conceived by Jaguar as a low-volume dream machine rather than a serious production model, but that changed when many on hand for the 1948 Earl’s Court Motorshow in London were simply flabbergasted by the sleek new Jaguar. The new XK120 combined jaw-dropping beauty and astonishing performance in equal parts. Although the swooping and curvaceous styling, strongly influenced by Jaguar boss William Lyons, showed influences of the pre-war BMW 328, it was still fresh, exciting, and full of performance improvements. It’s no exaggeration to say the XK120 has already gone down in history as one of the great automotive designs of all time. First launched in Roadster form in 1948, the XK120 was a test bed for the new XK engine, and when production began in 1949, the first car was shipped directly to Clark Gable. The 120 referred to a 120 MPH top-speed, making it the fastest production car available that year. The XK Series would go on to propel Jaguar to unprecedented sales levels in North America, and positioned them for success for decades to come.